For anyone who, like me, is a fan of the soundtrack from the Knight Rider television series, Don Peake and Hitchcock Media Records have just released two new volumes of music from the show. The new discs — volumes 2 and 3, respectively — just landed and are shipping right now. Volume 2 contains what looks like the complete soundtrack for two first-season episodes: “Hearts of Stone”, the first episode scored by Don after taking over for Stu Phillips, and “The Topaz Connection,” whose score has a sort of Vegas-style flair. 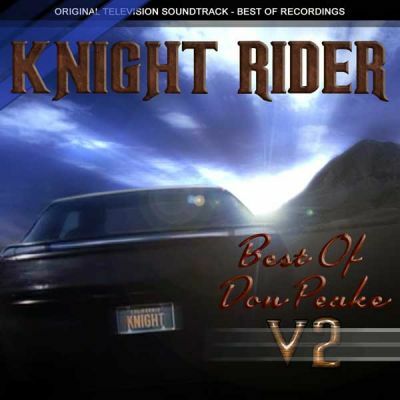 There is also a brand new remix of the Knight Rider theme song put together by Don, and four unnamed bonus tracks. Volume 3 is a re-issue of scores originally sold as a bootleg under the Hi-Tech Records label in 2000, which contains the mostly unabridged score from four episodes of Knight Rider’s third season: “Knight of the Chameleon,” “Lost Knight” (partial score only), “K.I.T.T. vs. K.A.R.R.” and “Knight in Retreat.” For fans who already have the Hi-Tech album, you’ll be pleased to know that Volume 3 has been remastered to provide a more beefed up and less flat sound, and also add some reverb and a wider stereo envelope. Hopefully some of the bizarre artifacts, panning issues and dropouts have been cleaned up too. Overall this should greatly enhance the tinny sound of the original disc. In addition, if you missed the formerly sold-out Volume 1, it’s back in stock now with new cover art to match the new releases. Volume 1 features a great variety of sample cues from six episodes spanning all of Knight Rider’s four seasons, and the sound quality here is excellent. Apparently it took four years for Universal to license the new material for release. Record label founder Ron Hitchcock reports that, with licensing hurdles over, licensing for future volumes will hopefully come much quicker. Releases of Don Peake’s Knight Rider soundtracks have had a colorful history — everything from bizarre promo discs from the ’80s (specifically, the complete score to “Diamonds Aren’t a Girl’s Best Friend”) to bootlegs issued without license. Now, though, it looks like Ron Hitchcock is doing a great job with the material, and given his label’s history and catalog, you can be sure that these efforts are 100% above board. It’s great to see Don’s work find such a great home at last. Now, my only problem is that I’m in Thailand until May, and I can’t get my hands on the new albums until I get back (they’ve been submitted to iTunes, but the approval process can drag on for a good while). Just one more reason to count the days.